POHANG, North Gyeongsang Province -- On the afternoon of Nov. 15, 2017, Lee Sun-mi was in class at Heunghae Middle School in Pohang, North Gyeongsang Province, when the building began to sway. At around 2:05 p.m. that day, a 5.4 magnitude-earthquake, South Korea’s second-strongest earthquake in decades, rattled the southeastern port city. There were no quake-related deaths but over ##1,500## residents were left homeless, forced to take shelter at a local gymnasium. Since then, fear has become part of life in Heunghae, the epicenter of the earthquake, as a series of aftershocks followed. 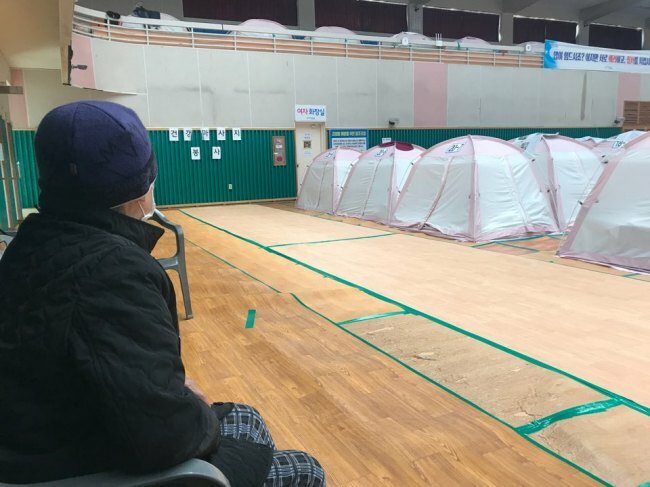 “It’s still dangerous to return home, they say, so I’m staying at the shelter,” the 15-year-old girl told The Korea Herald at the evacuation center on Feb. 19. “This gym is too cold and loud to study, but I have nowhere else to go to do homework. And I’m scared another earthquake might shake and destroy the shelter,” said Lee, adding that she has no idea when she can go back home. As of March 2, 388 people still remain in the shelter. Since the November earthquake, the region has suffered 97 aftershocks even as the country celebrated the Winter Olympics in February. The 4.6-magnitude aftershock on Feb. 11, injured several more people and sent them rushing back to the shelter. As the new school year started on March 2, Lee is not alone in struggling to remain calm. “There were visible cracks on the walls of my school. I’m not sure if it’s safe to study here,” said Park Jae-hyun, 16, a middle school student. A total of 227 schools in the region, and 2,165 private properties, sustained severe cracks in the walls, according to the city. During the Feb. 11 aftershock, outer wall of some school buildings collapsed while book shelves and furniture trembled, as seen on videos online. Parents of the students express fear and concern over safety in schools. “After the earthquake last year, one of my daughters had to attend classes at a nearby school for a while during which she struggled to adapt to the new environment,” said Bae Wol-mi, a mother of three. 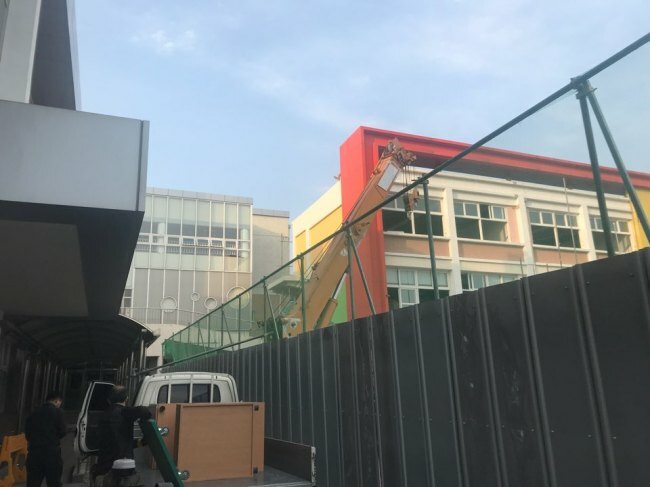 The school of her 9-year-old daughter, Heunghae Elementary School, was shut down last year due to heavy damage, sending its 420 students to either temporary classrooms made from shipping containers set up in the playground or other schools in the region. “Even if my daughter gets to study in the temporary classrooms, I have to ask, are the containers safe from an earthquake? The school buildings clearly weren’t,” Bae said in reference to the main school building that is under reconstruction. Many parents wonder whether they should leave for another town for the sake of their children’s safety. As of February 874 residents have left Pohang since last October, according to the city data, two weeks before the earthquake struck. Above all, there is a growing public concern over the lack of earthquake preparedness in the country which has long been regarded as an earthquake-free country until the latest quake in Pohang and the record earthquake in nearby Gyeongju, North Gyeongsang Province, in 2016. Less than 40 percent of schools nationwide are quake-resistant, according to the government data. “Seismologists warn even bigger quakes might possibly strike here again. My children become nervous even when their phones start to vibrate or by the sound of the door closing,” said Kim Sang-gi, father of two students who started school in the makeshift classrooms on Friday. “It’s a natural disaster and I know nobody can prevent it. But at least there should be a sense of security among students at schools when earthquake strikes again,” Kim said.